AgWeb recently reported that Senators Susan Collins (R-Maine) and John Thune (R-S.D.) have received the 2013 Champion of Agriculture Award presented by the American Agri-Women’s organization. American Agri-Women, a national coalition of farm, ranch, and agribusiness women’s organizations, has honored Collins for her “record of integrity, unsurpassed work ethic, and a steadfast commitment to the people of Maine…in addition to being a champion for women, [Senator Collins] is a leader on agriculture issues.” As a senior member of the Senate Agriculture Appropriations Subcommittee, Senator Collins has reportedly led a successful effort to prevent the USDA from limiting white potato in the National School Lunch program and from eliminating it from the school breakfast program. 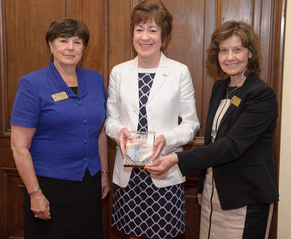 Senator Collins has also been involved in maintaining funding for integrated pest management and research of new potato varieties, according to a press release about the award. According to the respective press releases, Senators Collins and Thune were honored with the 2013 Champion of Agriculture Awards during the organization’s annual legislative Fly-In trip to Washington D.C. earlier this month.